Your garage door isn’t working very well. It’s making all sorts of strange noises. Now and then, when you press the remote, the door doesn’t even open or refuses to close. You don’t have time to take care of it. Who can you trust? You’re not alone in asking this question. So turn to a well-established garage door specialist, one who has been in business for several years, who can give you a written checkup of your garage door, and above all, who will discuss any work to be done with you before undertaking repairs. It’s much better to be safe than sorry. A tune-up will increase the potential durability of your garage door system. More importantly, it helps you be proactive before a more serious problem occurs, thus avoiding unpleasant surprises and unforeseen costs. You surely don’t want to stay stuck in your garage the very morning that you have an important meeting at work! To help you make an enlightened choice, contact us! What’s more, we can provide you with a free quotation. Essentially, the garage door technician will carry out three major steps: VERIFYING, ADJUSTING and LUBRICATING. To start with, there is 26-point verification of your garage door system. Lubricate all hardware parts (rollers, hinges, spring system) and the various door weatherseals (at the bottom, between the sections, and around the exterior frame), thus extending the life of all these elements. A tune-up of your garage door: an investment that really pays off! What if a component is broken or about to break? If you are home, we will confer with you and confirm the price of parts to replace. If you are not there, we will discuss it over the phone so you avoid any unpleasant surprises. You will be provided with a warranty on parts and labor. Is there anything I can do on my side to avoid problems? Yes… of course! 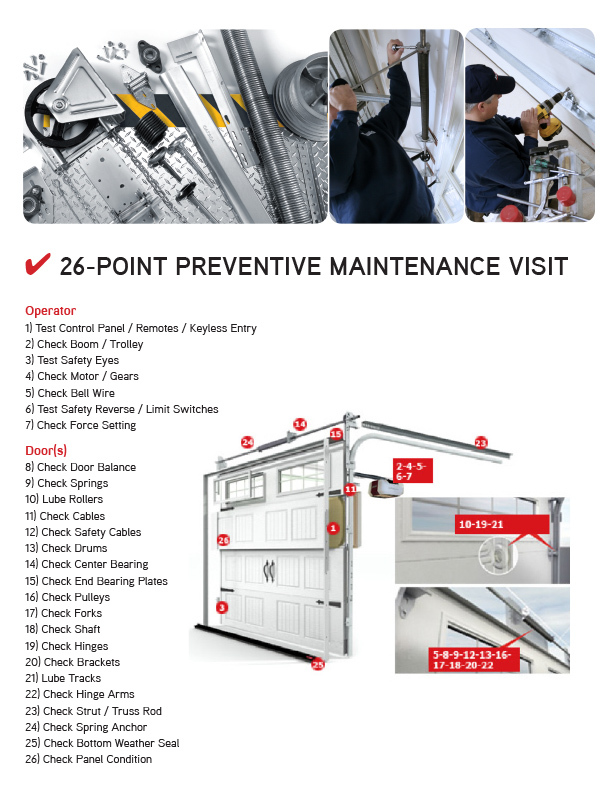 Following these maintenance instructions for your garage door needs only a few minutes of your time. It is recommended to carry out these verifications twice a year: before the winter arrives and at the start of spring. Before winter because it’s very maddening when you have an incident that forces you to leave the door open when the temperature is below freezing. At the beginning of spring because the winter is when your garage door takes a real beating. Remember that your garage door is the largest moving part of your home. What’s more, an increasing number of people use the garage door as the main entrance to the house. Consequently, you should place particular importance on its continued proper operation because this concerns your safety and that of your loved ones.